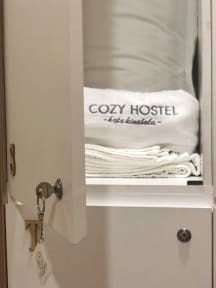 Cozy Hostel i Kota Kinabalu, Malaysia: Reservér nu! This property has 1 day cancellation policy. 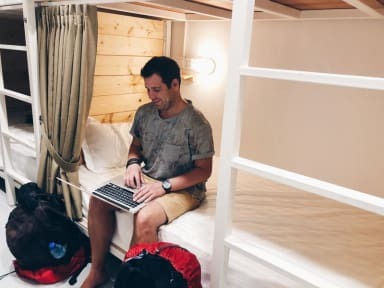 Failure to cancel within this time will in a cancellation charge equal to the first night of your stay. Your booking is non-refundable. If you choose to cancel your booking, or in the case of a no-show, you will still be charges the full cost of your booking. Thank you for choosing to stay at Cozy Hostel Kota Kinabalu. Our check in time at 3pm-9pm. Please let us have your flight number so we could estimate the time of your arrival. Our hostel located at KK Times Square, full address is Block F, Lot 33A, 5th Floor KK Times Square Kota Kinabalu. Please click this link for our hostel direction, before that you may take Grab to Celcom(Sabah) Regional Office kk Times Square. Cozy Hostel provide bunks bed type, we offer Large Bed with reading light, international plug socket as well as a personal locker for your backpack or personal belongings and each bunk have own Curtain that provides privacy (Please make your bed by yourself), 24 hours CCTV and security key card, high-speed wifi, towel, drinking water, tea, coffee, linen, pillow, blanket, daily house-keeping and etc. The remarkably spacious common area include separate TV Lounge, pantry, dining area, laundry area. All the friendly staff speak English. IMAGO shopping mall, 24 hour convenient store, local cuisine restaurants and dive and tour centre. Waterfront, ASquare food stall, Warisan Square, Philippine Night Market, Central Market. Kota Kinabalu International Airport (KKIA), Sunday Market (Gaya Street), Jesselton Point (Jetty to Tunku Abdul Rahman Park), Signal Hill Observatory Tower, Waterfront Seafood Night Market, Central Local Market, Philipino Night Market, Waterfront Bars and Bistros, and many more. Kindly, please email your arrival time or flight number in advance, we will email the direction to you once we got your reservation.